Josh Cullen played 18 times for Bradford City over a highly successful loan spell last season. But the young midfielder sadly picked the wrong moment to have his one and only stinker – the first leg play off semi final defeat to Millwall. Tony McMahon was the Bantams’ assist king over 2015/16. He was a reliable head to get his side over the line in seeing out a series of 1-0 victories. But then early on during the same play off encounter with Millwall, he lost his composure and was lucky not to be sent off after pushing Chris Taylor in the face. It was not the work of somebody with a cool head. Rory McArdle enjoyed another fine campaign playing alongside Reece Burke, but made an untypical error that allowed Lee Gregory to equalise. James Meredith was also a solid performer all year long, but he and Jamie Proctor lost Steve Morison at a corner, which left the Millwall man unmarked to make it 2-1. The City captain, Stephen Darby, tried to rally his troops in the second half, but they failed overturn the 3-1 deficit they fell to before the half time whistle. Billy Clarke missed the game through injury and led the attack in the second leg at the Den, yet couldn’t get the Bantams back into the tie. Mark Marshall was not even in the squad for the first leg and an unused sub in the second game. He watched on helplessly as his team bowed out. The glory and pain of the play offs lies in the fact that a season’s hard work can be defined in such a short space of time. Last season City brilliantly overcame a poor start, and a difficult run of form over winter, to finish fifth with 80 points. But it counted for nothing in the play offs, after a wretched 45-minute performance against Millwall in the first leg, where the home players froze on the occasion and failed to demonstrate their true ability. It left them with too much to do over the remainder of the two-legged tie, so it was Millwall who went to Wembley. For those seven players who were part of that squad and who are still at the club, the pain of losing to Millwall last year should act a motivating factor over the new few days. City have done remarkably well to reach the play offs for a second successive season, and that gives these players especially the opportunity to right those wrongs. They know just how horrible it can be to lose at this stage, and will surely be filled with determination to avoid a repeat. The miserable experience of 12 months ago should spur them on. They are part of a squad of players with differing levels of involvement in play off games. Nicky Law has talked about appearing in four finals and losing them all. One of those occasions was a Rotherham Wembley play off final defeat to a Dagenham side that included Romain Vincelot, who has also lost a play off final with Leyton Orient three years ago. Nathaniel Knight-Percival endured play off semi final heartbreak when at Wrexham and Peterborough. Even amongst those who went through the Millwall misery last season there is further experience to share, as the squad prepares for the emotional rollercoaster of the play offs. 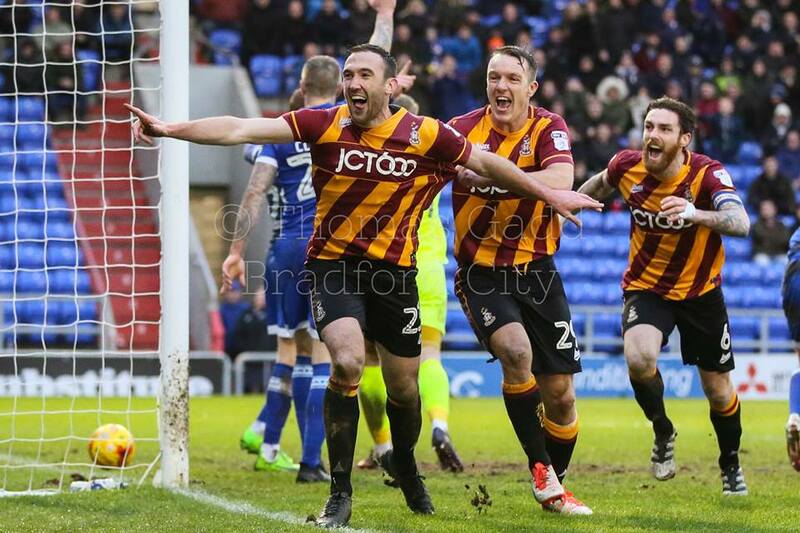 Rory McArdle and James Meredith are the two great survivors of the club’s rise and rise. Their involvement in the glories of the 2012/13 history makers season barely needs retelling, and they were key figures in the FA Cup run of 2014/15 too. Both players had appeared in play off games for other clubs, tasting the glory of promotion at Wembley for Rochdale (McArdle) and York (Meredith). McMahon lost a play off semi final with Sheffield United prior to joining Bradford City. Billy Clarke helped to shoot Blackpool to the Premier League via the play offs in 2010. Darby and Marshall were teammates at Swindon when they lost a play off Wembley final in 2010. They’re led by a manager with his own back catalogue of play off misery to share. Stuart McCall was famously a star player in the 1987/88 nearly season, where City – denied automatic promotion on the last day of the campaign – lost to Middlesbrough in the play offs. The 2-0 second leg defeat proved to be the last game of his first spell at Valley Parade. At Sheffield United 15 years later, McCall was a key man in a Blades side who were beaten the play off final to Wolves (after reaching the semi finals of both major cup competitions). And as manager of Rangers two years ago, McCall lost a play off tie against his old club Motherwell that denied them promotion. It is quite a collection of lost souls; but a life with hard knocks provides valuable experience that can be channelled in positive fashion. The pain of last season’s play off semi final defeat to Millwall was softened by the fact it was overshadowed by the club being taken over. This time around, our emotions are fully exposed and it truly will be agony or ecstasy. As City embark on another play off adventure, they’ll need wise heads and know-how to handle the big occasion. The spotlight weighs on their shoulders. The pressure to deliver is intense. The margins for error are thin. Bradford City is a club that has twice engineered play off semi final miracles in 1996 and 2013, but last season’s loss to Millwall proved that giving your opponents a head start is a dangerous game. City need 11 players on top of their game, and sensible in-game management to cope with the expectations. This group of players have proven all season they can handle big expectations and perform to a consistently high standard. Keep up that level over these next few days, and the club could be looking forward to another trip to Wembley.